This affordable dual-camera system captures daytime scenes nicely, but night video is below average. I was anxious to try the $240 Drive HD Dash 2316D dual-camera system and see what Cobra brings to the table these days. We gave the last dual-camera Cobra solution I reviewed, the CDR895D Drive HD, an Editor’s Choice, largely because of ease of use and low price. That system’s night video has since been eclipsed in quality by many cameras, even entry-level models. I expected and hoped the Dash 2316D had evolved with the times. Long story short: In terms of usability, the Dash 2316D is on point. There are numerous nice-to-have new features iRadar (Cobra’s information service) traffic alerts, and driver assistance. 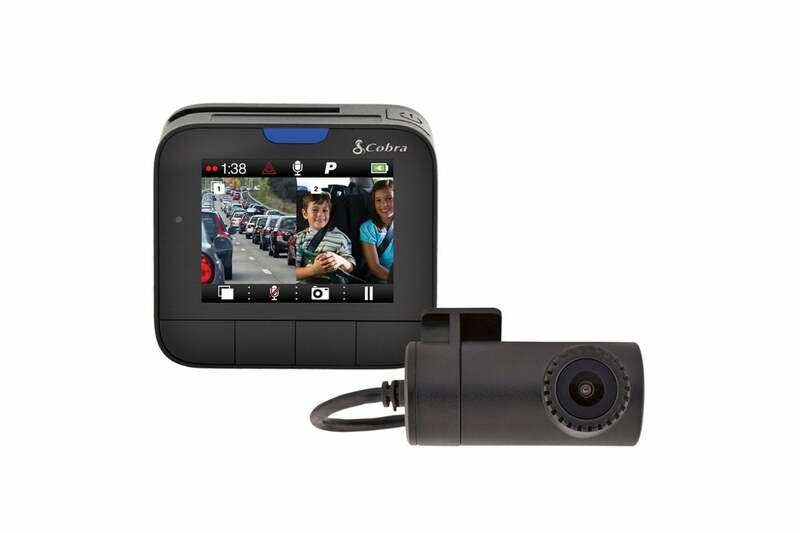 But when it comes to video quality, the Dash 2316D has not evolved, and there are a few other features I'm surprised Cobra hasn't improved. Note: This review is part of our dash cam roundup. Go there for details about competing products and how we tested them. 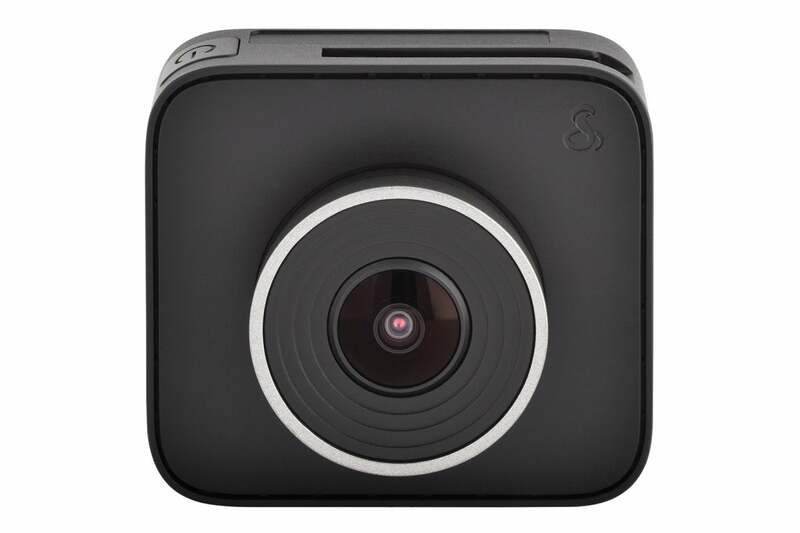 The Dash 2316D’s front camera, with a 160-degree field of view, is a small, squarish affair with a two-inch LCD display. It’s easy to hide behind your windshield mirror, which gives you a very good alibi in states that outlaw vision-obstructing devices on your windshield. You never know when a highway patrol officer will be looking for an excuse to ticket you. The camera offers four ports: a 3.5mm jack for the optional $50 GPS; a slot for the SD card; HDMI output for direct playback on your TV; and a micro USB port for power and connecting to a computer. The camera is controlled and configured using four buttons on the bottom that vary in function, illustrated by icons onscreen directly above the buttons. During normal use the buttons invoke: pause recording, take snapshot, mute microphone, and split/rear/forward view. Press the pause button, and you enter the settings mode. At the top is a blue button (silver for non-Bluetooth models) that starts emergency recordings (automatically overwrite-protected), and a “power”/display-off button. The Drive HD DASH 2316D front camera is small enough to hide behind most rear-view mirrors. That’s handy if someone claims it was blocking your view in a lawsuit. The 130-degree rear camera is a tube design, and captures video in 720p rather than the 1080p that the front defaults to. That’s more than adequate for legal purposes. 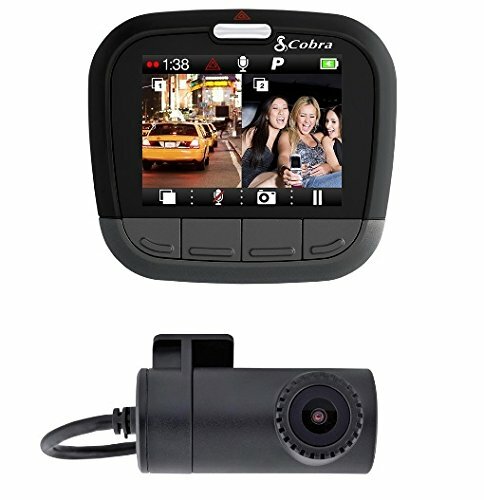 The display of the front camera and the rear window camera are shown here. Note that the small bit of cable shown is a bit misleading: Several cables are required to provide all the connections between the two units. The cabling for the Dash 2316D is complex, to say the least. Instead of two inputs on the front camera for power and the rear camera, the affair involves a Y-adapter and three other cables. With the CDR-895D, I thought it a clever way to morph a front camera that was meant to fly solo into one that plays nice with a second unit. Two years on, it seems more like a kludge that should’ve been redesigned by now. The front camera captures in four resolutions: 1296p/30 frames per second, 1080/30fps (the default), 720/60fps, and 720p/30fps. Higher-resolution selections will, of course, use more storage space. There’s also a parking mode that will continue recording for 5 or 10 minutes after power is removed. Driver-assistance features, or what I call bad-driver features, include lane departure and collision warnings for those with short attention spans. Word of advice: If that’s something you feel you need—take the bus. The Dash 2316D also sports Bluetooth for communications with Cobra’s iRadar iOS/Android app. I wish I could report that it worked well, offloading alerts to the camera and providing the GPS info that we always recommend. But for some reason, after one initial connect, I was never able to repeat the experience. I tried three different phones, and while the Dash 2316D would appear as “Drive HD,” it simply wouldn’t shake hands beyond that. Cobra says it’s working on a fix for Android. But this does point out the camera's reliance on your phone for GPS. Consider the $50 module. Both the front and rear cameras attach to the windows using semi-permanent sticky tape. The front camera mount is fully adjustable and will tolerate misalignment, but the rear one is more stubborn. Tip: Use a ruler and level to mark the mounting point first. As you can see below, the Dash 2316D’s day captures are quite good—bright, and with nice detail. I was told HDR was in play, and the colors seem a bit more saturated than with the CDR-895D, but it’s not quite as obvious as with some other cameras.The bit depth of the Dash 2316D’s captures was only 8 bits. HDR is generally associated with 10-bit color, though it’s also used to indicate a greater range of luminance. 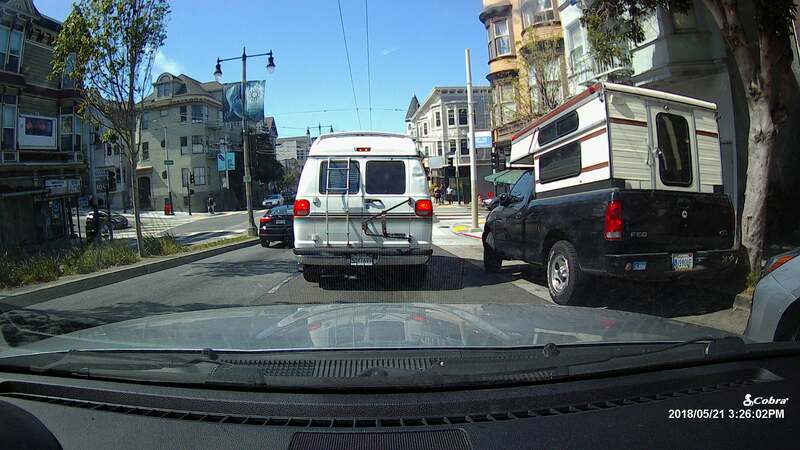 The daytime video captured from the Dash 2316D’s cameras (front is shown) is quite good. HDR isn't as saturated as with some cameras we've seen.. Things went wrong for the Dash 2316D at night. Nocturnal video from the front camera was acceptable in well-lit city situations, but way too dark and lacking in detail when we pulled onto a side street (shown below). The better cameras out there improve greatly on what the human eye can see. In this case, the scene was actually much brighter than it appears. The only thing positive I can say about the Dash 2316D’s night captures it is that there was only a moderate amount of headlight flare. The vertical flare shown below is largely due to my running out of windshield washer fluid. Sorry about that Cobra. The night video from the front video is lacking in detail and would be virtually useless in a court of law. Please note that the vertical flaring is largely the fault of a poorly cleaned windshield. My bad. 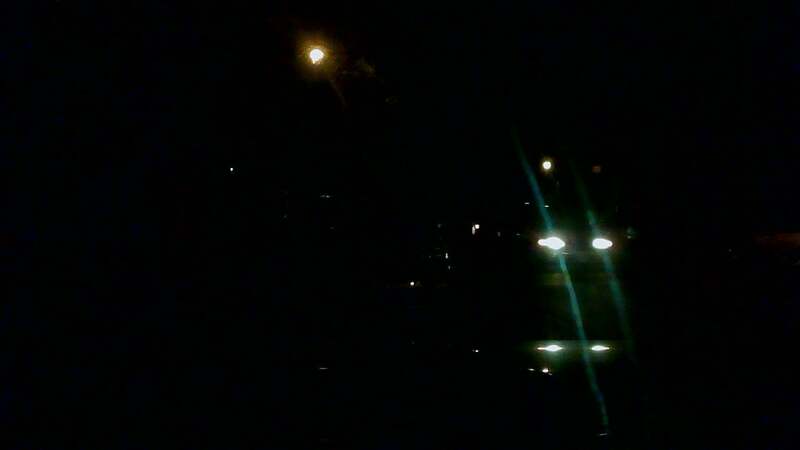 The rear camera video was even worse at night. Post-processing (upping the brightness and contrast) didn’t help with either camera, as I’ve seen with some other cameras. In other words, the detail just didn’t make it to video, whether it’s the sensors or the internal processing. 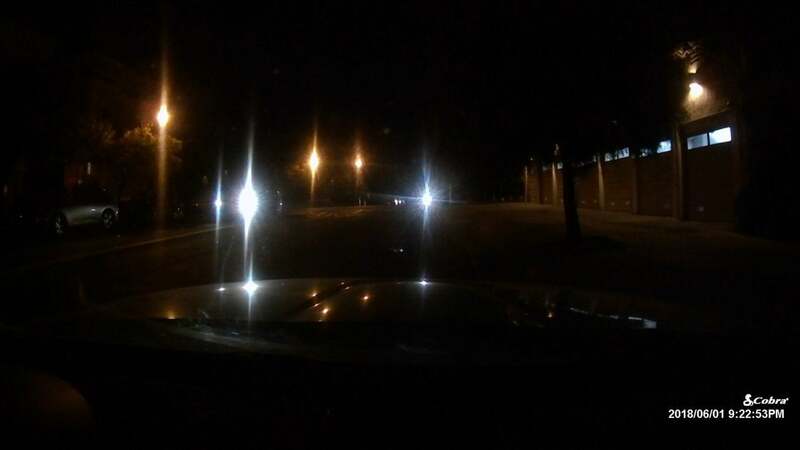 The 2316D’s rear camera captures show barely any detail at all, even with headlights lighting up the area. Two years ago we might’ve given the Dash 2316D’s night captures a pass, as murkiness was largely the norm. That was then, this is now. Other competing cameras leverage Sony’s STARVIS sensors, and the entire industry upping its game. Hopefully, it’s not simply a failing of the Ominivision sensors (front: OV4369, back: OV9712), but rather processing issues that can be fixed with a firmware update. As far as operating conditions are concerned, the cameras are rated from 14 to 140 degrees Fahrenheit. They ran cooler than average in my hands-on, even with the front camera’s display running full time. The G-sensor worked fine at the default setting, saving video when I hit a very large pothole on purpose to test it, but otherwise avoiding false positives. The improvements Cobra has made with the Drive HD Dash 2316D are certainly welcome. The integration with the iRadar app is nicely done, and downloading the GPS via Bluetooth could obviate the need for the $50 GPS unit if you’re a phone-centric user. I'd rather see the GPS on board. Overall, usability and design are top-notch. But all that means nothing if the video isn’t up to snuff, and the Dash 2316D’s night video most decidedly isn’t. Whatever the issue, as of now I can’t recommend the Dash 2316D system for nocturnal use, only when our friendly yellow dwarf star is out and about. Two years on from the 895HD, the Drive HD DASH 2316D offers only minor improvements, and none concern the video, which is weak by today's ever-rising standards. The iRadar app is useful, but GPS is only an option. To our mind, the cheaper 895HD (if you can find it) is still the better deal.